Yes, it’s true. All is now right with the world. Why? Because Baby finally has enough hair to hold a bow! Bibs are no longer her only accessory. Peace and balance, at last. In fact, ‘she’ has added quite a few accessories to her wardrobe lately. Sunglasses, a chic floppy hat that matches her bikini, faux leather moccasin-type flip flops. The list goes on (and on … and on). Actually, regarding the bibs, I’ve decided to use them less frequently. How else will we find enough time for Baby to wear all of her cute clothes before growing out of them? When she spits up on one outfit, we’ll just change her into another one! My kids all hated bibs and wouldn't wear them much past 8 months anyway. I used to just strip their shirts off and feed them. Well, at home anyway. She is so sweet. 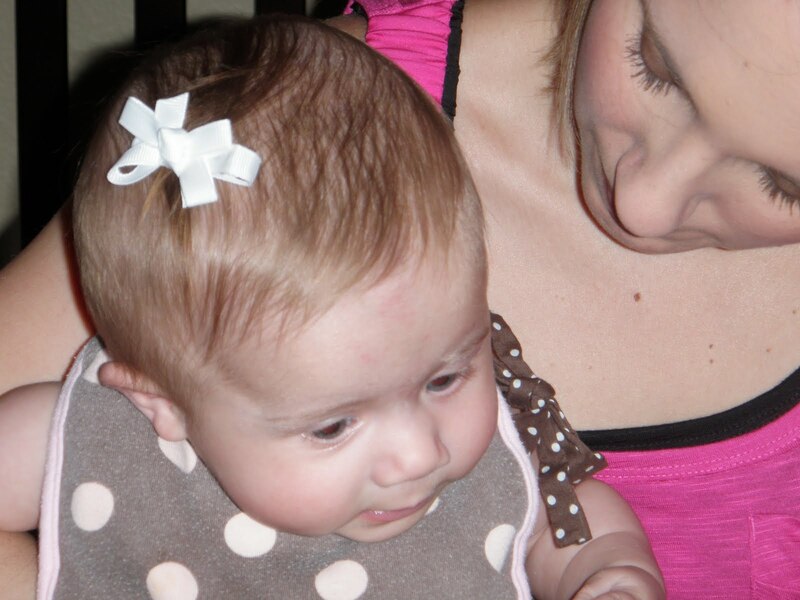 Love the bow... she is stylin!! I agree, since they grow out of clothes so quickly, let them be worn!!! LOL!! The bow is super cute!!! I completely agree on the bibs. They're going to get messy anyway...and why else do we own all those clothes?